Democrat Mike Frerichs - candidate for Illinois State Treasurer - is turning into a big-time "Watch what I say, but don't look at what I do" kinda guy. After loudly proclaiming that he wants to 'reform the office' of Illinois State Treasurer, he takes shady, tainted campaign cash that his campaign had to (after being roundly embarrassed) donate to charity. 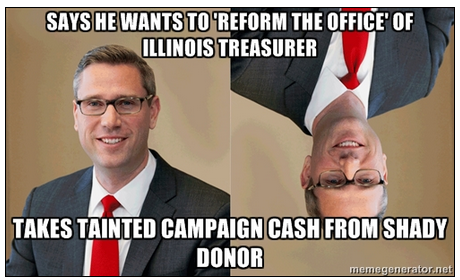 You can read the full back story on Mike Frerichs and tainted campaign contributions here on the Illinois Truth Team.